ZooLights at the National Zoo in Washington, D.C. is a winter holiday event that is sure to be fun for the whole family. The National Zoo presents a display of thousands of sparkling lights featuring sculptures of many of the Zoo’s most popular animals, including giant pandas, Asian elephants, gibbons, a sea lion, an octopus, and a Komodo dragon. Visitors at ZooLights will enjoy winter-themed activities, a laser light show, musical performances, train rides, tubing and animal exhibits. Visitors can warm up inside the animal houses and enjoy nocturnal animals. The Small Mammal House, Great Ape House, Reptile Discover Center, Think Tank, and Kid’s Farm will be open every night. Holiday treats will be available for sale including hot chocolate, donuts, and kettle corn. Families can take a photo with costume characters, or do some holiday shopping at one of the eco-friendly gift shops. No tickets are required. All proceeds from ZooLights concessions and parking sales will benefit a variety of Zoo wildlife conservation programs and initiatives, from educational opportunities to new and improved animal exhibits, to conservation science research projects. 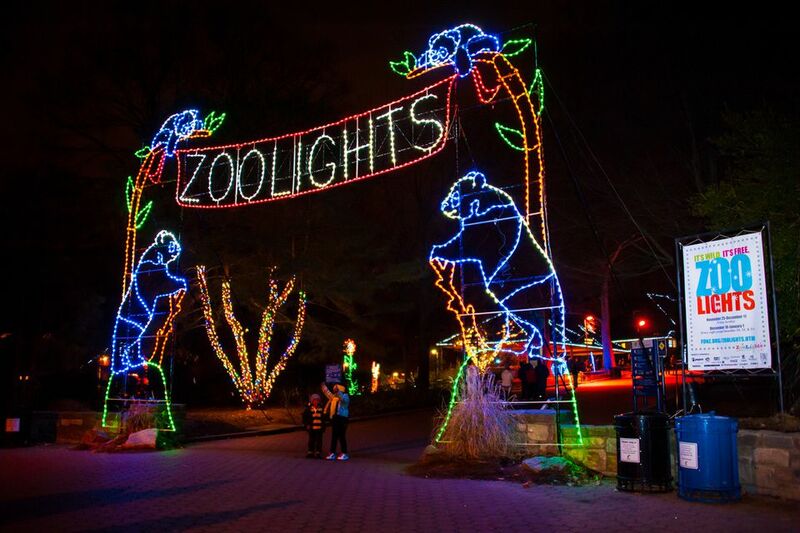 ZooLights is supported by a generous donation from Pepco. The National Zoo is located at 3001 Connecticut Ave., NW, Washington, D.C. The main entrance to the Zoo is along Connecticut Avenue. There are also two entrances at the east side of the Zoo, near Rock Creek Park. One is off Rock Creek Parkway, the other is at the intersection of Harvard Street and Adams Mill Road. See a map. Parking for ZooLights is $11 for Friends of the National Zoo members and $22 for non-members. The parking lots may fill up, so the best way to get to the Zoo is to take Metro. The closest stations are Woodley Park-Zoo/Adams Morgan and Cleveland Park. Every Saturday night, complimentary shuttle rides are provided by Big Bus Tours from the Woodley Park Metro station to the Zoo. This year's special nights have yet to be announced but last year included BrewLights, a ticketed microbrew and craft beer event. Guests enjoyed beer tastings from a dozen breweries and sample savory foods from top local restaurants, all under the bright lights of Washington, D.C.'s favorite holiday tradition. The National Zoo sponsors a contest every year that encourages bakers, artists, animal lovers and holiday enthusiasts to show off their creativity in designing an animal habitat. There is a non-refundable entry fee of $25 and space is limited to 80 participants. Interested participants must register online. The habits will be on display for the public to view during Zoolights.